This review is about item#41687843. 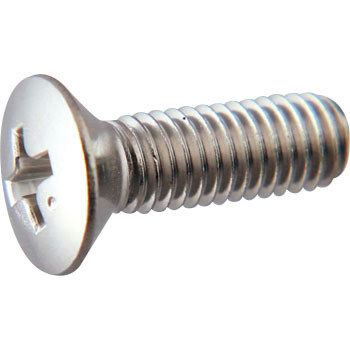 I am thankful that I handle such screws. Monotaro is reliable. This review is about item#41687213. This review is about item#41687134. It is a screw that is difficult to obtain, but it was saved by the low price monotaro. This review is about item#41687746. I got it soon, so the work ended in a short time. Because it was not in the home center, it was saved. This review is about item#41687317. This is perfect for rosette washers. It is useful. This review is about item#41687003. Since there is no handling in the tool shop of the business partner, it is very helpful. This review is about item#41687642. During maintenance of a car, the + part found a licked screw. I ordered genuine parts, but it was already "out of print" due to the exclusive parts of the model over 30 years ago. So we removed the genuine parts, observed the size and shape, then bought this item with Monatarou. The taper angle of the cup, the subtle rise of the face part of the screw, the size under the neck It was the same as it was Don Pissha. Since the material is SUS, the eyes do not match, but on the contrary it is a special feeling? There may also be good. Motorcycle makers, especially Honda, have many "screws" of special parts not in JIS standard, and they use M7 size as well. Although it was not M7 this time, it was saved because the equivalent product was available! This review is about item#41687886. With the S6 of the neck under the M6 ​​SUS, it was difficult to obtain it with ordinary commercial products, and I was not interested in placing an order with a high price that I can not believe it was bespoke from the home center. I appreciate that you can do the installation work I was giving up. This review is about item#41687965. Screws of the necessary length were not found in the home center etc. We found something of your choice in your product search, it helped, pack quantity was also appropriate, I was relieved to see various stocks. This review is about item#41687931.